Over at 3 Quarks Daily my current post reproduces a section of a slender book I’ve put together with the help of Charlie Keil and Becky Liebman. The book collects some historical materials about efforts to create a department of peace in the federal government, starting with at 1793 essay by Benjamin Rush, one of our Founding Fathers: “A Plan of a Peace-Office for the United States.” It includes accounts of legislative efforts in the 20th century and commentary by Charlie Keil and me. 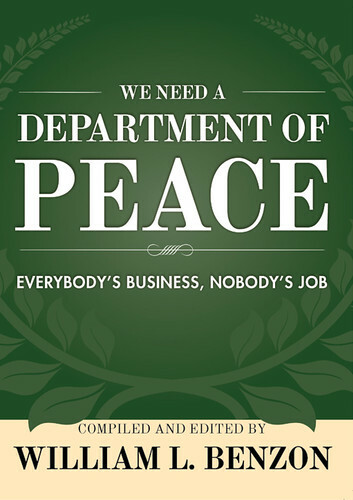 The book is entitled We Need a Department of Peace: Everybody’s Business; Nobody’s Job. It’s available at Amazon and Barnes and Noble in paperback and eBook formats. 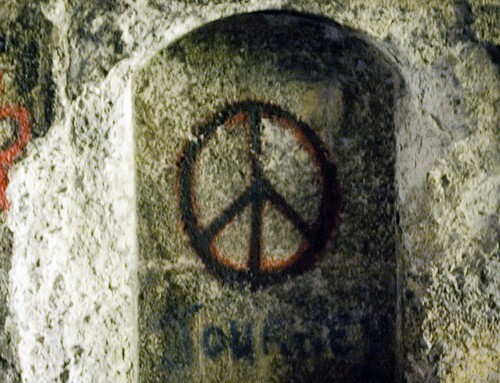 Below the peace symbol I’m including the Prologue, which is by Mary Liebman, an important activist from the 1970s. The book include other excerpts from the newsletters Liebman wrote for the Peace Act Advisory Council. The human race knows a lot about how to make war. We should: we’ve been doing it since Biblical times. Experts define “war” as any conflict in which the dead number more than 3,000 people. Below that number – by revolution, insurrection, armed exploration, native uprising, clan feud, violent strikes, lynching, riot, excessive partisanship of soccer fans, or plain personal murderousness – none of that counts until more than 3,000 people have been slaughtered. Then it gets in the record books as a war. Disregarding our barbarian ancestors, the Attilas and Genghis Khans for whom war was a way of life; overlooking two centuries of carnage in nine Crusades, and the Hundred year’s War, which occupied France and England for 115 years, just looking at the world since Columbus discovered America, we find that the world has been at peace less than half the time, and the wars are getting bigger and worse. Out of this collective experience with war, we’ve learned how to do it. Homer left notes. We have the memoirs of generals and statesmen from Caesar down to modern times to guide us. There are textbooks to study. And almost everyone in government has served in the armed forces or some other war-connected duty. They understand it. By contrast, what do any of us know about how to make peace? Nobody has ever done it. Until Hiroshima, few people talked very seriously about doing it. The Bomb changed things forever. We began to realize that no nation would ever again fight through to glorious victory. The celebrations, the cheering crowds in Times Square, the church bells ringing and the bands playing – those are sounds that belong to history. They will never be heard again at the end of any war, anywhere, by anybody. So while we are not better men than our ancestors, and maybe not much smarter, we are faced with the necessity of making peace – and nobody knows how. War is not a natural disaster. It is a manmade disaster, directed and carried out by ordinary people, who are hired and paid by other ordinary people, to make war. It will stop when ordinary people decide that, whatever satisfactions and rewards war may have offered in the past, the risk is now too high and the return too low. If you are ready to invest in a new and exciting American enterprise, you can start by spending an hour telling your Congressman why you want a Department of Peace. Mary Liebman published these words on the first two pages of the February 1973 issue of PAX, the newsletter for the Council for a Department of Peace (CODEP). It was a message she had been honing for two years and would continue for three more. We note that back then it was true, as she said, “almost everyone in government has served in the armed forces or some other war-connected duty.” That’s no longer true. Conscription ended in 1973 with the eventual result that most people in government are too young to have faced the military draft or to have friends and relatives who did. Why a Department of Peace?